Hey! 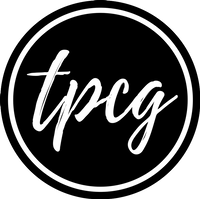 If you've been reading TPCG for a long time, you would know how lazy of a kitchen-person I was, and how I wanted to help my mom in cooking and all other kitchen related activities. And all of a sudden, since May, you will find so many recipes on the blog, and also the 'Food' page being added in the Tabs Bar. There are various factors that drove me towards cooking. And if you wish to help your mom, or simply cook, here's a guide from TPCG that will help you to do so. Plates with Designs ~ If you're an Indian, you might probably be using plates, bowls, and spoons made of steel. If that's not the case with you, then congrats! But yes, I do, and many of the families I know, do use steel. So if you want to bring a sudden zest for cooking, there has to be a gorgeous set of plate, bowl, and spoon to make the eating a worthy experience. I myself don't like to eat from a steel plate, and that is a turn-off for me. Hence, I use all the possible non-steel things as I can. Cute Oven Gloves ~ If you're using the old kitchen-cloth, it's high time you invest in a good pair of gloves for all the activities related to oven. You can also get a cute kitchen-cloth and use it for yourself exclusively! It works. I feel totally amazing to get the baking tray out of the oven by using my super-cute red gloves, which have cherries and flowers on them. Good Online Sources & Gadgets ~ More than half the recipes that I've tried recently have all been through online sources. If you want to make the process of reading from any online source readable, you need to use sources and gadgets that will help you to do so. You can either write down the recipe on your recipe journal, or use apps like Bing Food & Drinks App to get a larger set of alphabets. The best way you can read the online recipes is by using a laptop. 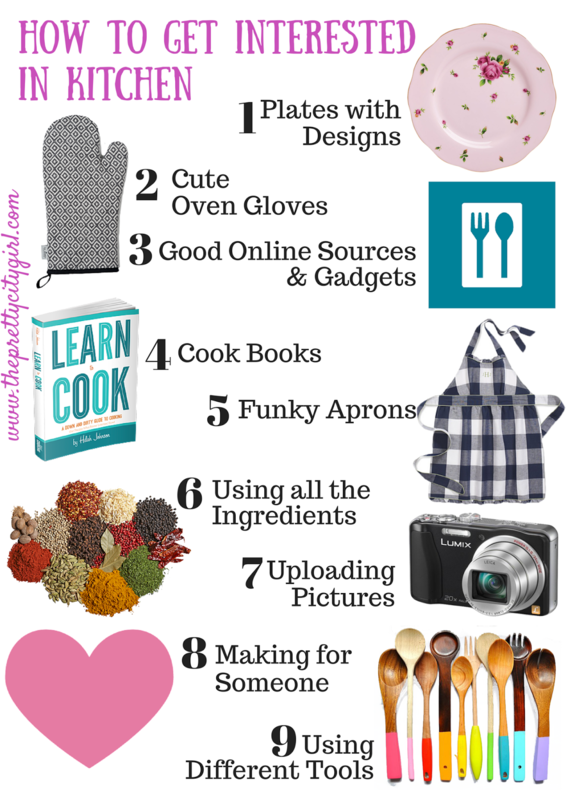 Keep the laptop or tablet in kitchen, and simply enjoy cooking! Cook Books ~ When you're tired of reading online, you will need a good offline source. Get yourself a cook book and start cooking. See to it that the book contains your favourite recipes, or the one you would actually try. Don't go for the recipes that require rare utensils. Go for those that would be difficult, but not impossible. Funky Aprons ~ Alright, I seriously have to purchase an apron. I had asked my mom just recently, and she happily said that we would buy one, as she is too happy to see me in the kitchen. Using all the Ingredients ~ How often do we do this? There are no sprinklers for the cake? No problem. There is no cream? We will use the homemade cream. There is no mozzarella cheese? We will use the regular cheese. Wrong! You need to stop replacing ingredients. A pizza requires mozzarella cheese, and if you haven't used it on your pizza yet, you have not simply tasted heaven. Postpone the recipe by one day if you want, but make sure you get all the ingredients. Remember how I went to buy all the food-enhancers? Uploading Pictures ~ If you're on my Snapchat list, you must have freaked out by now seeing how often I post about the food I make. There's a reason behind that. If I have to upload a recipe-picture, I see to it that it looks (and tastes) tasty. Even when I cook, I always imagine how would people react to it. I post it on TPCG to get appreciation and motivation to continue doing it (and of course to present different recipes for you!). Making for Someone ~ If you make for someone, you'll love it automatically. If there's a birthday, bake a cake; if there's a Mother's Day, declare that you would make all the meals of the day; if there is a Father's Day, cook your dad's favourite dish. If you make it for someone, you'll cook with love and interest, and slowly slowly, a day will come when you no longer would require a special day to cook. Using Different Tools ~ I don't know why, but if I use an egg-beater, or an ice cream scoop spoon, or a baking tray, I instantly feel like a professional chef. You might try it too. Instead of using a regular spoon to serve ice cream, use an ice cream scoop one to feel as though the ice cream is bought from outside. It does work with me; you try, and let me know. That's it guys. Trust me; cooking is a no-big thing. Even I was as lazy as you are today, and look at me now! Go ahead, and bring a prep into your cooking, and I'm sure you'll be a great cook some day!